Barnyard Banter by Denise Fleming – R enjoyed listening to “Barnyard Banter” and practicing animal sounds with me. I read each page multiple times in order to really have R listen to and repeat animal names and sounds with me. 1. Melissa & Doug Animal Sounds Puzzle – R is not always keen on putting the animal pieces into the animal sounds puzzle, but she loves to listen to and imitate the animal sounds. When prompted, she can now consistently replicate sounds made by a cow, sheep, dog, cat, duck and horse. a. Make an animal sound and ask the child to name the animal. The question prompt would be, “What animal makes the sound moo?”. b. Show the child an animal toy ask him/her to name the animal or tell what sound the animal makes. 2. Horse Hair – R had her first introduction to “gluing”. I drew a picture of a horse (maybe a donkey.. Lol) on construction paper and placed double sided tape along the horse’s mane. I gave her cut pieces of yarn and she stuck them in place. I used the command “stick” to describe the action as I demonstrated it to her. Each time she placed a piece of yarn, I said stick. b. Make all the farm animals on separate pages and staple the pages together to make a homemade book about farm animals. 3. 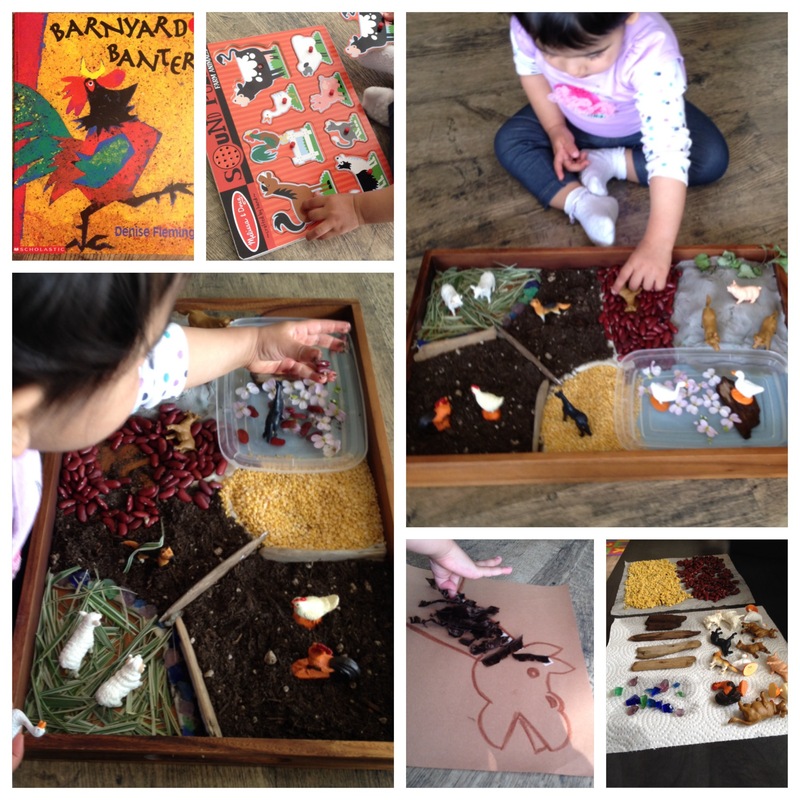 Farm Sensory Bin – I offered R an invitation to play using a sensory bin that had a variety of different textured ground covers and animals in different places. Included was a grassy field, a couple of soil fields, a “hay” field made of yellow lentils, a “rocky” field made of kidney beans, a pond created with water in a plastic container and a “muddy” hill made using homemade play dough. R had a lot of fun making her animals “eat”, making animal sounds, pushing animals into the play dough mud hill, “washing” the animals in the pond and mixing the different parts together. Considering the amount of people in the world who don’t have enough food each day, I often feel guilty about using edible materials for R’s play. So, I really make an effort to make sure we reuse all the materials as much as possible and for as long as possible.